What dog can resist the delicious combination of beef and bacon? Cream together the butter, oil, baby food and eggs. Mix the dry ingredients with the wet mix, and then stir in the bacon bits. Pour into a greased and floured 8" x 8" baking pan. If desired, sprinkle a light layer of bacon bits on top as a frosting substitute. Bake in a 350 degree F oven for approximately 35-40 minutes or until the center of the cake springs back when lightly poked. Oven times may vary. Last edited by hanna_light; 05-01-2013 at 08:46 AM. If youâ€™re running short on time, the quickest and easiest way to make a dog birthday cake is simply to open a can of his favourite food and slide the contents out in one piece. Then cover with bacon strips, and his favourite biscuit treats all around. Done in five minutes and your dog will love it! Another combination that sounds nothing like a cake to you, but it will make your dog the happiest dog in the whole world. Treat your dog with this specail beef jerky cake. You need: 1.5 cups of flour, 1 tablespoon of baking powder, Â½ cup of soft butter, Â½ cup of corn oil, 2 jars of strained beef baby food, 4 eggs and 3 strips of beef jerky. Beat the butter until softened and add corn oil, beef baby food and eggs. Mix all well together. Combine the dry ingredients in a separate bowl and add them into the mixture. Crumble the beef jerky and add into the mixture. Pour the mixture into a loaf pan and bake in the owen for approximately 1 hour on 200C, or until done. Cool the cake completely. Coat the whole cake with frosting made out of plain yoghurt, or cottage cheese for example. 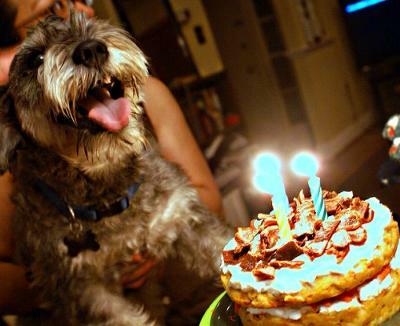 Decorate with a little more crumbeled beef jerky and surprise your dog with a delicious birthday cake. Here is a naturally sweet dog birthday cake recipe that satisfies the chocolate-loving hound's taste buds without risking the toxicity from natural chocolate. Cream together the butter, oil, eggs and optional vanilla. Stir in the carrots and carobs. Pour batter into a well-greased 8"x 8" square or 8-inch round baking pan. Bake for approximately 35 minutes or until a knife inserted in the center of the cake comes out clean. Baking time may vary in your oven. 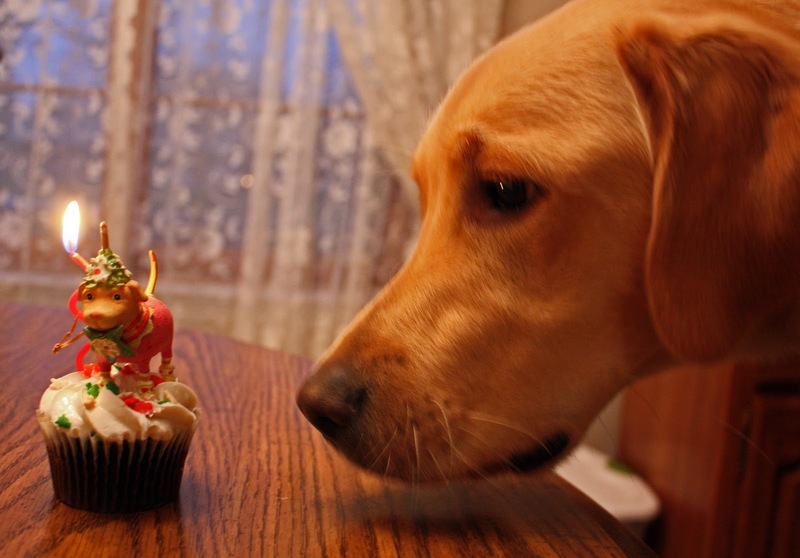 Although birthdays only come once a year, you may still want to avoid feeding your dog a sugary frosting. Here are a few frosting substitutes you can try. 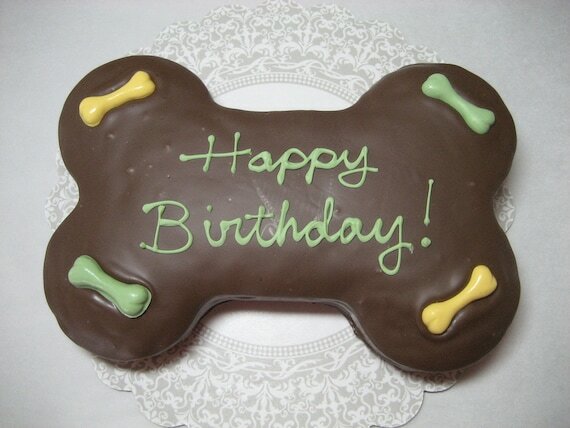 Take a look at some tasty frosting ideas for dog birthday cake recipes. All you need to do is combine the given ingredients and blend them thoroughly till a smooth creamy paste is formed. Cream cheese: Well whipped cream cheese is quite spreadable and tasty too. Just be sure to refrigerate the cake when you're finished decorating. Plain yogurt: Yogurt makes a healthy cake topping, and the plain variety compliments just about any cake flavor. Due to its consistency, yogurt is best used on a birthday cake you plan to leave in the pan. Again, be sure to refrigerate. Peanut butter: Most dogs love peanut butter, and the creamy consistency makes this a natural choice for a frosting substitute. Just be certain your dog doesn't have any kind of peanut allergy before you give it a try. You can also blend a little peanut butter into cream cheese for added flavor and color. By babybear in forum This and That!